To become a Center of Excellence in the field of IT & related emerging areas education, training and research comparable to the best in the world for producing professionals who shall be leaders in innovation, entrepreneurship, creativity and management. The University commenced academic activities from July 2002 with undergraduate B.Tech. degree programs in Electronics & Communication Engineering, Computer Science & Engineering, Information Technology, Bioinformatics, Civil Engineering (from July 2003), and Biotechnology (from July 2005). The University is spread over 25 acres of lush green picturesque slopes of Waknaghat, in District Solan of Himachal Pradesh, creating a tranquil environment that can heighten the spirit and energy level of all learners and inspire them to optimize their learning efforts. 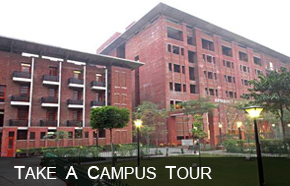 The architectural design of the campus is entrusted to M/s Arcop Associates Pvt. Ltd., an eminent Canada based architect firm, with the construction being undertaken by the Group itself. Functionally and aesthetically spread out, the architectural plan builds on providing an intellectual ambience in clusters in an exciting landscape that is easy flowing and community-friendly. At present a total built up area of over 600,000 sq.ft. comprises the Academic Block (with lecture theatres, classrooms, tutorial rooms, laboratories, administrative and faculty offices, and the library), Hostel residences for boys and girls (for around 1500 students), faculty residences, Guest House, Annapoorna, Open Air Theater, sports facilities, and other associated services. At present, around 1000 students (boys and girls) alongwith 35 faculty reside on the campus. Internet connectivity is currently available to all the faculty & students. The University encourages all students to make the life outside the classroom vibrant and enjoyable by engaging themselves in multiple extracurricular areas, no matter how talented or experienced they are in any of those areas. This is enhanced by best of facilities and equipment designed to make life outside the classroom an exciting and memorable experience. JUIT is a wired campus with fiber-optic network connecting its labs, classrooms, library, and student hostels. The computing infrastructure consists of state-of-the-art multi processor servers accessed by an array of multimedia desktops. It is destined to connect the computing facility with various national and international facilities. The University has five Computer laboratories – with more than 450 nodes operating on UNIX/Windows 2000/Linux. All the lecture theatres/classrooms have multimedia projection systems for facilitating computer-based and web-based learning. Besides the computer laboratories, the University has other well-equipped labs in Electronics, Communication, Bioinformatics/Biotechnology and Civil Engineering disciplines.